Strategies for achieving the trader's edge. Strategies for achieving the trader's edge. 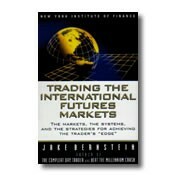 Beginning with a brief history of futures trading, Jake Bernstein explains how the European futures markets evolved to their current dynamism, covering what is traded, where and how, and highlights "up and coming" markets. Backed by detailed charts and graphs, this book takes traders through the fundamentals of "traditional" technical analysis, then on to a variety of trading systems, all designed to capture the essence of growing market volatility.